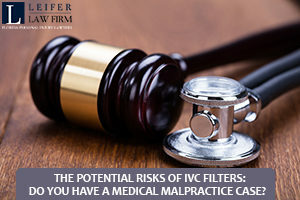 The Potential Risks of IVC Filters: Do You Have a Medical Malpractice Case? The IVC filter, or inferior vena cava filters, are very small devices that are implanted into your vena cave to help prevent serious problems, such as a pulmonary embolism. These devices are primarily used for individuals who are at risk of developing blood clots. If the blood clot were to break free, it could enter the lungs and potentially be fatal. Currently, the FDA has already received thousands of complaints related to these devices and the potentially negative consequences they may have. There are some complaints from patients that state the filters have moved or become detached from their proper position, resulting in perforations in the walls of the individual’s inferior vena cava. In some cases, the device has fractured and resulted in small debris traveling into the heart and lungs. When this happens, the person is at risk for suffering an embolism or stroke, among other complications. If you, or someone you love, has suffered complications or even died because of a faulty IVC filter, then you may be able to file a medical malpractice lawsuit and receive compensation. To know for sure, you need to contact an experienced medical malpractice attorney. For cases that are more severe, such as situations where the filter has moved and perforated or punctured the vena cava, you may experience a pulmonary embolism, internal bleeding, a stroke and may even require open heart surgery. The fact is, people have been reporting their concerns related to the IVC filter since back in August 2010. This is when the FDA issued an alert to medical professionals regarding the issues that were present with these filters. If you are worried that you or someone in your family may have been injured due to IVC filter issues, then the best course of action is to contact an attorney. They can review the facts of your case and determine if you are due compensation. If you need help with a medical malpractice case related to IVC Filters, contact the attorneys at Leifer Law by calling 561-660-9421 today.